Since there are two questions and it is not clear which particular question you seek answer to we are attempting to answer the first question here. In the diagram the capacity of the system is determined by the slowest component in the system. The system has a join so we need to examine the capacity of each leg of the join first. In the upper leg of the join the slowest component is no. 2 i.e. 15 units / hr and this is the capacity of that leg. In the lower leg the slowest component is no. 5 i.e. 15 units / hr. Hence the total maximum possible capacity feeding into the join at component no. 7 is 15 + 15 = 30 units / hr. 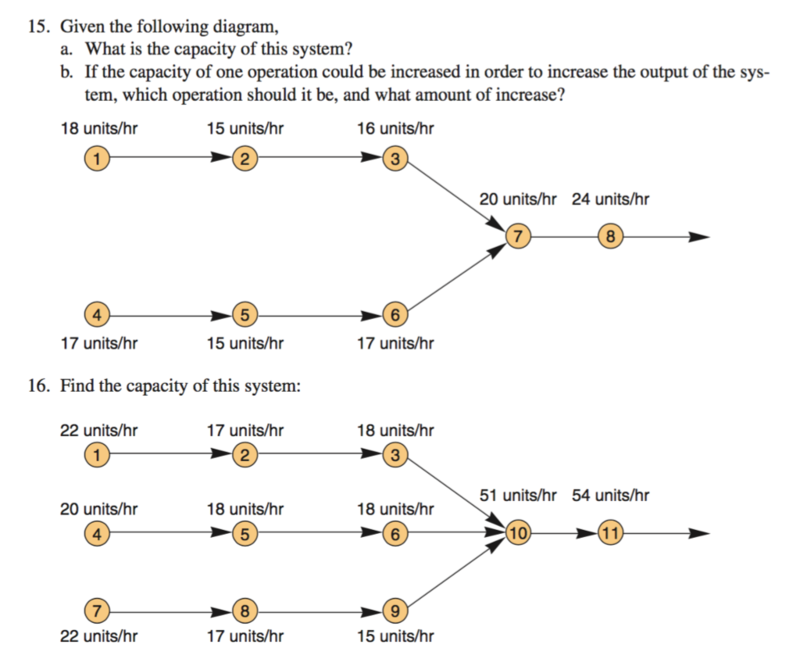 Since the capacity of the component 7 (receiving the input from the join) is 20 units / hr hence the maximum possible capacity of component 7 is minimum of 30 and 20 which is 20 units /hr. Now considering the last component i.e. no. 8 its capacity is 24 units / hr. Hence the maximum possible capacity of the steps / components 7 and 8 is minimum of 20 and 24 which is 20 units per hour.